Last time I wrote about my Origins Experience. Let’s finish up with the last few days of Origins. Day 3 started like any other: got up, worked out, ate some food, and hit the road. For food, I brought a Colman cooler full of apples, string cheese, pretzels, and tomato juice. Hey, I’m on Weight Watchers, so we’re trying to eat a bit healthier at the con! Also, having a mile long hustle to my station is a bit of a bonus to losing weight. This was the first day I was able to hit the con floor. Origins always seems massive, but I know it’s nothing compared to the big dance–GenCon. It’s also fun to see a few familiar faces as I walk around. I talked to the fine people at Prolific Games, Stronghold Games, Plaid Hat Games, and Catalyst Game Labs as well as many more. That’s the absolute best part of this con-small enough that you actually get to KNOW people in the industry, but large enough that industry GIANTS will be there talking with their fans. I was also able to pick up a couple of games. Lynnvander was there and they were giving out kickstarter copies of Albion’s Legacy. I got my copy there, saving everybody some shipping. I also got a copy of Jarl, the successor to The Duke. Then it was off to the Catalyst Games room to run some Valiant, Cosmic Patrol, and Shadowrun. Not too many takers today for Valiant and Cosmic Patrol. These are still awesome games that run quick, but I know they are not the main attraction for Catalyst. After Valiant/Cosmic Patrol, I was able to get a game of Jarl in. It’s a great game that builds on the mechanics of the original. Can’t wait to play some more. My time with Catalyst ended with some Shadowrun. I ran the first level con missions. I love these Origins Missions as mine is about breaking into the CAS via plane and getting lost in the woods with some hillbillies. Lots of fun roleplaying and laughter was had by all. Friday ended with me attending the Secret Gaming Cabal event, but there was trouble afoot. I later learned the full details, so here they are. The Secret Cabal sells pint glasses. They don’t make any significant money off these, but they are still selling items while not playing to be part of GAMA, the show host, or renting a booth. That’s the kind of offense they take your badge for. And that’s just what happened. A GAMA representative took two of the Cabal’s badges and was about to cancel the event. Some words were exchanged, and my personal hero Stephen Buonocore, president of Stronghold Games and the hardest working man in gaming, stepped in and fixed the issue. Once again, I’m glad I’m also a demo agent for Stronghold Games! While at the meet up, I got to talking with some guys from Canada. Great guys all, and it’s fun to see the international appeal of different board games. Saturday was my birthday, so I was lazy and didn’t work out. I started the day the same as any other by eating, running to the convention, and then hitting the con floor. At 10 AM, I had two events: the board game geek exchange and a Dungeon Fighter demo. I was the only person there for Dungeon Fighter, so I started a demo, and then ran off to the BGG event. I didn’t know what to expect, but I did not expect this! People hold up signs with their name so others who bought or traded games with them can get their games. I got the Bioshock Infinity Game, Caverna, Kingdom of Solomon, and Small World Realms all for about $110. Great deal! I was sad my Dungeon Fighter demo fizzled, but that was my fault. However, Happy Birthday to me! Then it was off to Catalyst to demo RPGs. Here is where some awesome happened. I had groups for both Cosmic Patrol and Valiant. We had an amazing time; the Cosmic Patrol group was a group of friends who absolutely love 60’s Sci-Fi, and the Valiant RPG was with another group of guys who have read the majority of the comics. Those demos fly by too fast, so it was then off to running intro games for Shadowrun. And here’s where it got strange. We didn’t have enough new players for Shadowrun, so I was the odd man out. With no players, I got bored and just started grabbing people walking past our room and getting them to join Shadowrun: Crossfire. I got a full game together (they almost won, but lost in the final scene), and one of the players asked to demo the RPG. He and another intro player were taken away by the room captain to something special. I found out later they were sent off to play Shadowrun with the show guest of honor. Saturday was highlighted with Catalyst buying the Catalyst Demo Team pizza. I’ve worked for quite a few demo companies, but none have bought me dinner! Best part was it was my birthday so I got a free birthday dinner thanks to Catalyst. Once again, Catalyst is showing how much they appreciate and love their demo team. I honestly don’t need a ton from the game companies I work for, but it is these little things that really make me feel appreciated. That makes me feel proud to go forth and demo these games at other cons. Sunday is a sad day as the con’s ending. I worked out, checked out, and for once, drove to the con. I barely made it to Christian Gaming Guilds mass. It was a packed room full of awesome people. After church, I hit the con for the last time. Sunday is deal day! I bought a few games, but the biggest were the deals at the AEG booth. AEG knows how to make money the last day! I like to think I’m a hustler, but ho-ly cooow, these people were a well oiled machine! I ended up buying Empire Engine, the dual expansion to Lost Legacy, and Planes. They even threw in a laughy taffy to sweeten the deal! Saved a bunch, but bought more than I was planning. My final event of the con was a winner takes all game of Realm of Heroes by Mr. B Games. The rules would be taught, and the winner would get to take the copy of the game home with him/her. I showed up, and I was the winner-Mostly because no one else showed up! Not even the person teaching the rules. I went to the Mr. B Games booth and was told they might not have even registered the event. So that was a bit strange. But, they said since I was the winner; why not take a copy of the game. So in the next few weeks, get ready for a review of Realm of Heroes! Then it was back to the say good bye to all my demo friends at the Catalyst booth and game room. Parting is such sweet sorrow! Post Origins News and Highlights! Honestly, my best part of the con was something I saw on the way out. One of the players from my grab-random-hall-goes Crossfire game ended up playing a regular Shadowrun demo that turned into the special guest game. He ended up back playing a full four hour game that Sunday. That’s why I do this-not for free games, not for cool swag, but to get people into the hobby. It felt good to be part of his first Shadowrun experience. I hope to see him next Origins. First the sad news-I came down with some major con crud, which is why this is so late. I ended up going to Urgent Care and getting some drugs to deal with not being able to breathe. Didn’t get anything that makes me see colors, but I do get to breathe. So, I’ll call that a win. But the good news- Despite all the extra fun having to drive around much more than I wanted to; I did get back into working out. Hotel exercise rooms are always deserted during cons. I ended up losing two pounds during Origins. As I’m on Weight Watchers, that’s a loss I’ll take. So all said and done, I bought a few games, ran as many as I could, and feel appreciated by my friends and the groups I worked for. Origins may have beaten my physically but emotionally and spiritually, I feel better than ever. Can’t wait to read, play, and run some more Shadowrun-See you in the Shadows! So 20 is YOUR max, huh? Not mine! Increase one ability score by +1. Choose one of your ability scores, your new maximum for that ability score is now 22. If another feat says a maximum of 20, this feat supersedes that maximum. If you can stand tall, you can also fall quick. When you take a hit, you don’t get to choose to take a dive-you just do it automatically. You’re a lightweight when it comes to taking a hit, falling more times than Glass Jaw Joe. When determining if you are knocked down from a strike, divide your physical limit by 2 (rounding down, minimum 1). You automatically are knocked down if you take five damage. Basics-Vie for galactic dominance! 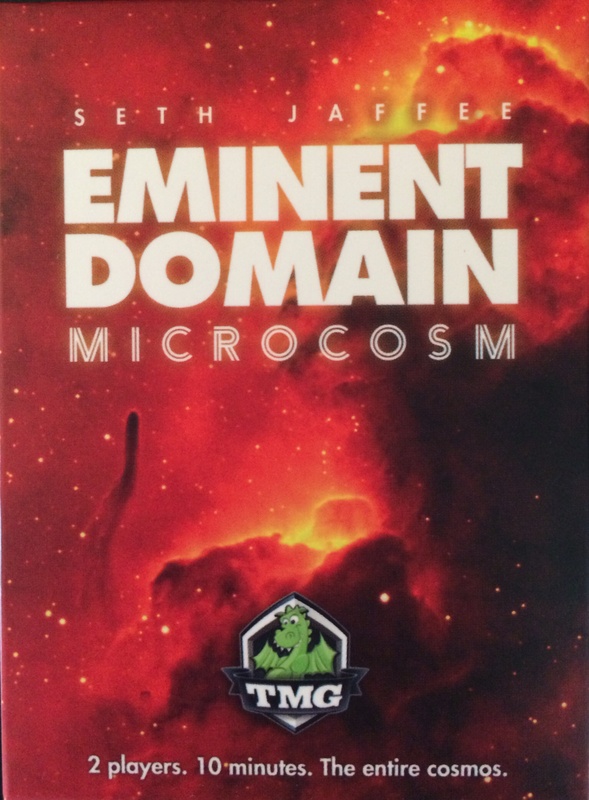 Eminent Domain: Microcosm is the two player microgame version of the popular Eminent Domain game. The game is set up by separating the types of planet cards based on how many colonize/warfare it will take to get that planet. These cards are placed face down. Then, the main deck of action cards is shuffled and three are placed face up in a row to be selection. Finally, the five different technology cards are placed face up for all the players to buy. After set up, players take turn drawing a face-up or top of the draw pile card, refreshing the visible row, and then playing a card or drawing as may cards as the player wishes from his or her discard pile. The cards have an action on them, a symbol for other actions, and a way to score end game points. The main actions on the cards are research, warfare, and colonization. When a player plays a warfare or colonization card for its action, he or she chooses a planet pile. These planet cards have different values of both colonize and attack needed to take the planet, but these values are hidden to the player when he or she chooses. Players can show, not play, other cards from the player’s hand to meet these values. If the colonization is successful, then the planet is placed face down in front of the player. Planets have a symbol that can be revealed to add to other played action cards. If a player plays a warfare card and has the needed symbols, then the planet goes to the spoils pile. Planets in the spoils are only worth end game points and cannot be revealed for their symbols. But, warfare has an added bonus. A player can declare warfare on an opponent’s colonized planets, stealing them, and making the game much more combat focused. The last major card type is research. Research allows you to take a technology card from the center row OR move an opponent’s technology row to the center row. If a player can shows three more research symbols on other cards, the player can take the research action again moving the same or other research cards around. The technology cards provide extra symbols for research, colonization, warfare, or other actions. Play continues until every card from the selection row is taken, and then the players score points based on the cards they have: one point per colonized or planet in spoils, one point per political symbol they have, and then they get extra points based on the extra point conditions on all the cards they selected. Winner of the game has conquered the (micro)cosmos! Digging deep into the SR rules lately. Here’s one to keep that troll up longer when he takes a missile to the chest. You take a licking and keep on ticking! When you take damage, you are not knocked down until you take double your physical limit in damage. You are also not automatically knocked down if you take 10 damage. I see a lot of builds out there for two weapon fighters. Let’s build on that. You are a master of multiple strikes making each more painful than the last. Each time you attack with a melee weapon, do damage, and are able to add your strength modifier to the damage, increase the damage by the number of times your successfully damaged the target. As an example, your second attack would do double damage, your third would do triple, and so on. Lot’s of Shadowrun lately, but let’s do a bit more. This time for all the summoners out there. You a a master of the managed magical. Those that you summon or bind fell your personality on them like a weight. Any spirit you summon or bind owes you one additional service. You must have at least one service for this quaility to trigger.